Mahapanchayat, Moradabad, 2011 -- Photograph by AIUMB. 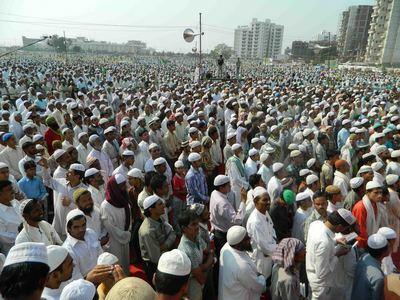 On October 16, 100,000 Indian Muslims gathered for a "mahapanchayat"—a mass assembly of local council leaders—in Moradabad, a city in Uttar Pradesh, the country's leading state in population, with about 200 million people. At a press conference announcing the convocation, Syed Mohammad Ashraf Sahab Kichowchhwi, general secretary of the All-India Ulema and Mashaikh Board (AIUMB)—a body of moderate clerics and spiritual Sufi leaders—spoke out boldly against fundamentalist Wahhabism. Kichowchhwi denounced the radical doctrine inspired by Saudi Arabia as "a virus for society" and assailed Wahhabis he said had gained control of India's Muslim communal institutions. Moradabad -- Photograph Via Wikimedia Commons. "The majority of Indian Muslims do not accept them as their religious leaders," said Kichowchhwi, the head of a prominent Sufi shrine, Kachhochha Sharif, about 300 miles southeast of Moradabad in Faizabad, also in Uttar Pradesh. He elaborated, "the flag-bearers of Wahhabism . . . do not lead the 80 percent Sunni and Sufi Muslim population of India." (India's Muslims—some 150 million, or 14 percent of its citizens—are the third largest Islamic community in the world, after those of Indonesia, 215 million, and Pakistan, 160 million). 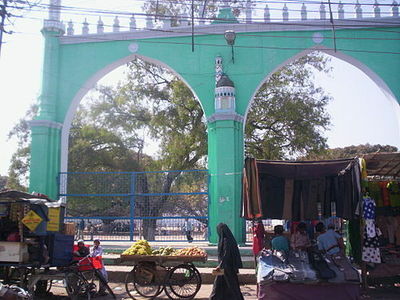 Kichowchhwi accused functionaries from the All-India Muslim Personal Law Board, which supervises the application of Islamic family law among Muslims, of joining the clerics and teachers of the Dar ul-Uloom Deoband sect, which inspires the Taliban in Afghanistan and Pakistan, in "promoting the imported ideology of Wahhabism from the Arab world." His blunt language shocked India's Muslim media. Ajmer Sharif Shrine -- Photograph 2010 by Shahnoor Habib Munmun, Via Wikimedia Commons. The outspoken position of Kichowchhwi was endorsed by 13 other keepers of Sufi sites, including Syed Shahid Mian Chishti and Syed Mehdi Mian of Ajmer Sharif, India's outstanding Sufi monument, which was bombed in 2007 with two people killed and 20 injured. Ajmer Sharif is the mausoleum of the 12th- and 13th-century figure Moinuddin Chishti, the most beloved South Asian Sufi, and like other Sufi sanctuaries, is often visited by non-Muslims. 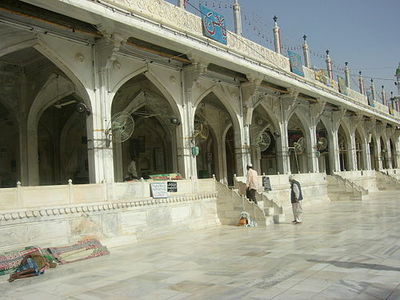 The Ajmer Sharif attack was one in a series of brutal assaults against Sufi institutions carried out across Pakistan and India since 2005 by Islamist extremists who, as Kichowchhwi pointed out, condemn Sufis and ordinary Muslim believers for memorial recitations from the Koran, "sending blessings to the saints and our ancestors," which the Wahhabis prohibit as alleged polytheism and an unacceptable innovation forbidden in Islam. The Wahhabi argument against these long-established Muslim customs, which are present in every Islamic country, often holds that they imitate Christian devotions. Kichowchhwi has warned Indian Muslims previously of Wahhabi infiltration of their institutions. Early last year he called on moderates to "liberate our properties"—referring to 10,000 shrines, mosques, and madrassas invaded successfully by the radicals in Uttar Pradesh. In his latest statement, he described the Wahhabi literature distributed for free or at reduced prices as "nothing but propaganda." Now, the AIUMB leaders have gone further in their censure of Wahhabism. According to Kichowchhwi, the Wahhabis have usurped and are stealing the assets of the Islamic endowment (waqf) boards in India, "and for them it is justified to loot property." He claimed that since the radicals have never established or contributed to any such pious foundations in India, they have no right to direct them. He pointed to the systematic Saudi devastation of the Islamic architectural heritage of Arabia as a precedent for the seizure and destruction of Sufi shrines in South Asia. In his recent commentary, Kichowchhwi departed from his previous theological polemics against Wahhabism to promise earnest loyalty to his country. "Indian Muslims will never tolerate anyone indulging in anti-national activities," he said. "If ever any Muslim is found indulging in such activities, it must be assumed that he is guided by the Wahhabi ideology. Sufi and Sunni Muslims are nationalists and are always ready for any kind of service to the nation. . . . Sufi and Sunni Muslims who constitute the overwhelming majority of Muslims in India respect humanity and can never be traitor[s] to their nation." This pledge repeated language employed by the AIUMB's national secretary, Syed Babar Ashraf, in publicity for the Moradabad event. Babar Ashraf wrote, "Wahhabi extremism is sweeping across the sub-continent. And after Afghanistan and Pakistan, the radical Wahhabi ideology is aggressively engaged in the radicalization of a few Indian Muslims. It is time for the silent majority to speak up and take the center stage. A vast majority of Muslims in India are Sunni Sufi Muslims who are nationalistic, patriotic and followers of the Sufi saints." He accused the Wahhabi hardliners, "through charities and capturing mosques/madrassas" of "indoctrinating innocent Muslims and spending billions of dollars to hurt the democratic and secular fabric of the country." Babar Ashraf challenged Wahhabism as "a big threat to entire humanity as well as the internal security of our nation," adding that the AIUMB "wants to send a message to the present government that moderate Muslims will not allow [the Wahhabis] to grab the Indian soil . . . for spreading terrorism." The AIUMB has submitted a sheaf of memoranda to Indian authorities calling for changes in religious affairs, including enhanced protection of Sufi shrines, and auditing and monitoring of religious endowments. They demand reform of madrassas to encompass modern education alongside traditional religious instruction, as outlined in proposed legislation to establish a Central Madrassa Board for India, with Shia as well as Sunni participation. The moderate group emphasizes the need for "quality modern education centers" in districts where Muslims are concentrated. They asked for more girls' schools and colleges as well as employment incentives for women, with at least one girls' school in each local district, and at least three in every local jurisdiction with a Muslim majority. In another heartening development, the AIUMB proclaimed its solidarity with Indian Christians, whom the Sufis noted had been targeted in a little-known outbreak of violence on August 25-28, 2008 in Kandhamal, a Hindu-majority region in India's eastern coastal state of Orissa. There, Christian settlements were torched, 25,000 Christians fled, and at least 28 people were killed. The Sufi group additionally protested against Christians having been obstructed bureaucratically from erecting churches, and "illegal occupation" of Christian properties. In May 2011, the monitoring group International Christian Concern reported that a 17-year-old Christian female, Nirupama Pradhan, had been raped and murdered by Hindu militants in Kandhamal, and charged that "serial murders against Christians" were ongoing there. South Asia obviously has no lack of opportunities for sectarian violence—the AIUMB also recalled the massacre of Muslims in the Indian state of Gujarat in 2002. But in contrast with Pakistan, where moderate Muslim religious figures as well as secular politicians appear faint-hearted in the face of the extremist offensive, Indian Muslims, guided by Sufis like those in the AIUMB, are fighting back. 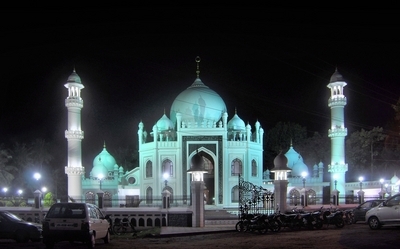 Illuminated mosque in Kerala, 2009 -- Photograph by Challiyan at ml.wikipedia, Via Wikimedia Commons. In the southwest coastal Indian state of Kerala—where Muslims first appeared in the subcontinent, but also home to a significant Christian community—axe-wielding Islamist fanatics last year sliced off the right-hand palm of T.J. Joseph, a professor at a Catholic institution, Newman College. Joseph allegedly insulted Muslims by including the name of Muhammad in an examination testing students on grammar in the local Malayalam language. Twenty-seven Muslim men were arrested in the incident, and Joseph's hand was reconstructed through skin grafts. Nevertheless, the Christian professor was arrested for allegedly inciting communal discord. He was released but was dismissed from his employment at the college. The detained suspects were charged with rioting, suppression of evidence, and similar non-terrorism charges, in January of this year. Their case is pending. But in response to the atrocity, young Muslims came forward to donate blood to Joseph, and the Sunni Students Federation of Kerala has organized a campaign, like that of the AIUMB, to educate its members on the dangers of Wahhabism.